Seventeen-year-old squire, Eric Hamden, is certainly a looker, but he has to prove himself if he’s ever going to get anyone to notice him for more than sharpening blades and being a naive to his master, Sir Trogsdill. Eric lives in Gyllen Castle in the kingdom of Hirth in the realm of Fallhollow. The castle is white with blue turrets and sits atop a mountain surrounded by rich farmlands. The pristine Cloverleaf River runs through its rolling green landscape. 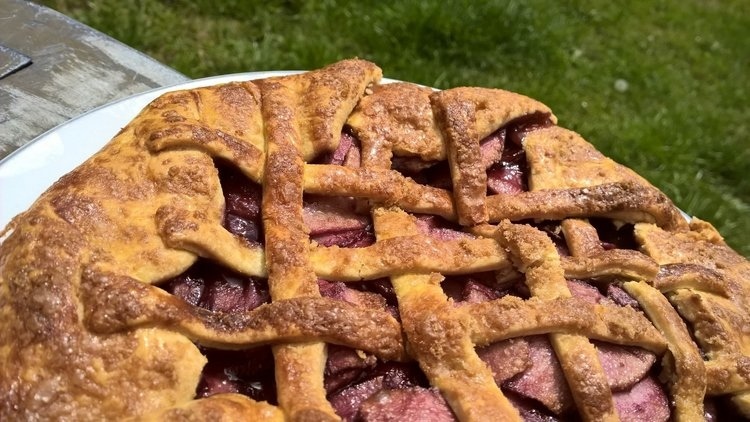 Living in a castle, surrounded by finery, and groomed for luxury, Eric’s tastes run a bit more on the extravagant side, so this rustic Red Wine Apple Pie, with its rich, buttery crust is perfect for him. This recipe is the first in a series of recipes I have created with author J. Keller-Ford for characters in her new book In The Shadow of the Dragon King, to be published in 2016. This will be the first book in The Chronicles of Fallhollow trilogy. See below the recipe to find out more. Note. you need to start the preparation for this pie 24 hours ahead of time. 1. 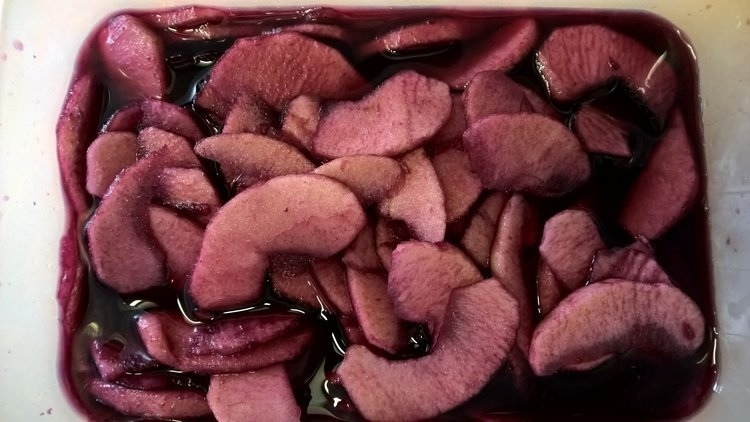 Place the apple slices in a tub and pour the red wine over them. Cover and store in the fridge for around 24 hours, shaking it around occasionally. 2. The next day, place the flour, sugar, salt and butter into a mixer with a paddle attachment. Mix until well combined and there are no more lumps of butter. If you don’t have a mixer with paddle attachment, you can mash it together with a fork instead. Try to keep your hands out of it so that it stays cold. 3. Lightly beat the egg yolk and milk together and pour into the flour mixture. Mix until it comes together. If the pastry seems too soft to roll, add a little more flour, if it is too dry and crumbly, add a little more milk. 4. Place the pastry on the counter and work it lightly with your hands until it is pliable. Wrap it in plastic wrap and refrigerate for about 15 minutes. 5. While the pastry is chilling, drain the apple slices and leave them in a colander to continue draining, shaking them around occasionally while you do the next few stages to remove as much of the wine as you can (the apple-infused wine makes a lovely drink, so don’t pour it away!). 6. Pre-heat oven to 180C/350F. 7. Break off a small piece of the pastry (a little less than would fill 1/4 cup), re-wrap that and refrigerate. Roll out the larger piece of pastry on a lightly floured surface into a round until it is roughly 12 inches in diameter. It doesn’t need to be a perfect shape. 8. Place a piece of baking parchment on to a baking tray and carefully lift the rolled pastry onto it. 9. Place the drained apple slices in a bowl, mix with the granulated sugar, flour, vanilla and salt and mix well. 10. Tip the apples into the centre of the pastry circle, and spread out, leaving a border of about 2 inches around. 11. Fold the edge of the pastry over the edge of the apples, working your way around, creating folds as you go. Again, don’t worry about perfection, it’s rustic. 12. Remove the reserved small piece of pastry and roll it out into a rectangle approximately 8×3 inches, then using a pastry cutter, cut it into 8 long strips. 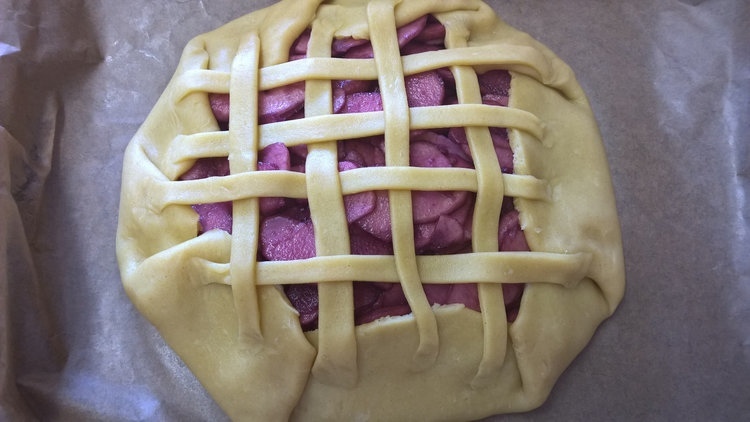 Weave those over the pie to create a lattice, and gently smooth the ends into the pastry edging. 13. Beat the egg well with a fork and brush it generously and evenly over all of the pastry. Sprinkle the brown sugar evenly over the pastry and fruit. 14. Bake for about 45 minutes until it is a deep golden brown color all over. Leave to cool in the pan for about 10 minutes and then either serve hot, or transfer it to a rack to cool. Carefully lift onto a serving plate to serve. In the Shadow of the Dragon King, coming September 2016 – A seventeen-year-old squire with knightly ambitions reluctantly joins forces with a sixteen-year-old overachiever to slay a dragon, free the realm, and maybe even get the girl. J. (Jenny) Keller Ford is a scribbler of Young Adult and New Adult speculative fiction. As an Army brat, she traveled the world and wandered the halls of some of Germany’s most extraordinary castles in hopes of finding snarky dragons, chivalrous knights and wondrous magic to permeate her imagination. What she found remains etched in her topsy-turvy mind and oozes out in sweeping tales of courage, sacrifice, honor and ever-lasting love. When not torturing her keyboard or trying to silence the voices in her head, Jenny spends time collecting seashells, bowling, screaming on roller coasters and traveling. 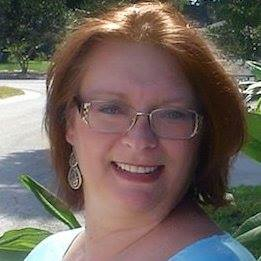 She is a mom to four magnificent and noble offspring, and currently lives in paradise on the west coast of Florida with a menagerie of royal pets, and her own quirky knight who was brave enough to marry her. If you try out any of the recipes or suggestions on this site, why not pop back and comment on the post to tell us how it worked for you? As the official mystery eater I can report that this pie is incredibly difficult to resist … sorry! What a cool idea!!! The pie looks wonderful too. Glad you like the idea – it lends itself well I think to this kind of book. 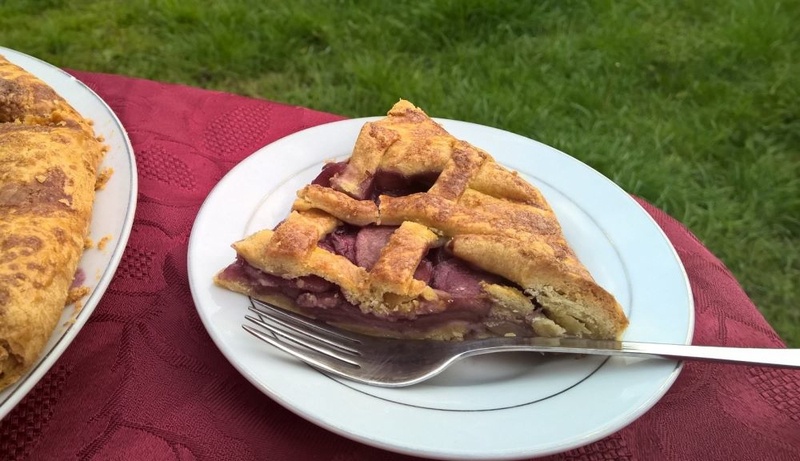 I’ve never seen a wine-drenched apple pie before, but I’m sure it’s probably been done before somewhere! Ah yes I see, there were two reasons I chose red wine, firstly because this character is from medieval times, I figured red wine seemed more medieval! But also, I was thinking of the dessert you get of pears poached in red wine, so I thought if it works with pears, maybe it would with apples. Shoot. I forgot. I’ve done pears in red wine and duh, medieval times and red wine. Of course. I not running on all cylinders and will be taking a blogging break for the summer. Have fallen behind on too many projects and need a ‘rest’. Post will be going out later today. 🙂 Miss you already, Vanessa. A lovely and delicious collaboration! Ah fab! That seems to have gone quick! A jam packed full of adventure three weeks. Three weeks gone already! I’ve read quite a few of your posts even though I haven’t commented on many, not much blog time again lately. Oh heavens no need to comment all the time Vanessa. I really want people just to come by when it suits. I think finding balance in life and setting priorities is so important for all of us. Not sure if I fully understand if the baking tray is a pie pan or a cookie sheet? If it’s a cookie sheet, they I assume that the pastry dough hardens to hold its contents without leaking, right? This sounds spectacularly yummy! And what a fabulous idea to do this in conjunction with a book release. Brilliant! Such a cool pairing idea for a book! I think you two just might be onto something here!